SIOUX CENTER – An expert on medications will be a few steps away at Promise Community Health Center for medical providers and patients. 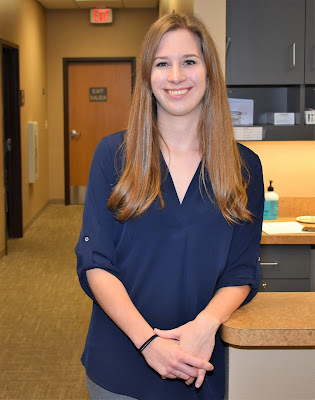 Kendra Borchers, doctor of pharmacy (PharmD), joined the health center’s team this week in the new position of clinical pharmacist. Her hours will be 8 a.m.-5 p.m. Monday, Wednesday and Thursday and on an as-needed basis to serve Promise's patients. team as an onsite clinical pharmacist. to both medical staff and patients. In implementing the new PharmD program, she will serve as an important resource to both the medical staff and patients. “Through this program, the health of the patient and the community can be positively impacted,” Borchers said. Emily Tuschen, co-chief executive officer and chief operating officer at Promise, said the health center had been analyzing and considering implementing a clinical pharmacist for quite some time – noting that not many organizations of Promise’s size offer the service. In her role, Borchers said she will counsel patients about medications, provide information to patients and staff regarding changes in medications or new developments, aid patients in obtaining medications, assist the medical staff with medication selection and dosage adjustment, and assess patient profiles to improve medication use. She said PharmD will be a “very beneficial program” for Promise. Borchers, 25, said she always was interested in the medical field and desired a career that would enable her to positively impact patient health in a direct way. She decided to take the pathway to pharmacy because she would be able to interact in a unique way with both patients and providers to provide optimal care. After graduating from Sioux Center High School in 2011, Borchers went on to Drake University in Des Moines. She earned her doctor of pharmacy degree in 2017. She then received her residency training at St. Luke’s Medical Center in Sioux City, June 2017-July 2018. She now is excited to fulfill her goal to return to her hometown and put the skills and knowledge she gained through her education to work “to positively impact the health of the community.” She noted that the comprehensive array of health services offered at Promise will present her with various ways to make a difference. She is impressed by what she has seen so far. In her spare time, Kendra Borchers enjoys reading, doing puzzles, watching movies, playing cards and board games, and hanging out with friends and family.